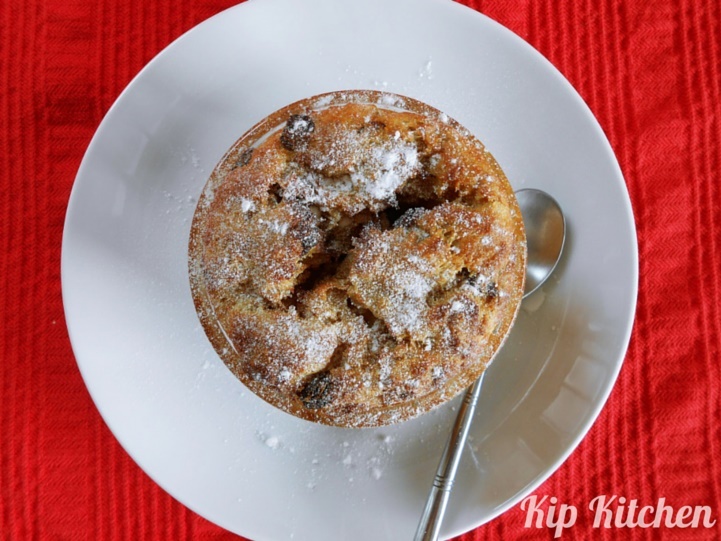 The easy bread pudding recipe you’d find below reminds me of home and Xmas. In my childhood days, my mom had to manage four kids running around, playing and screaming every day. She knew she had to find activities to keep us occupied if she wanted to have moments of peace and quiet. 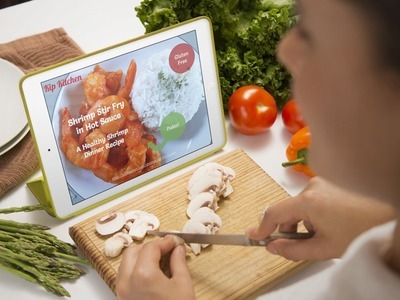 Being a smart and practical woman, she introduced us to cooking from a young age. Come Christmas time, she would whip out her Xmas bread pudding recipe and put us to work. 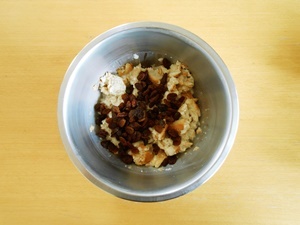 I have great memories of making the bread pudding mix. Rolling my sleeves up, mixing the milk and bread with my bare hands. The splooch sound is fun when you’re a kid! It’s a close contender with making French toast in our family. According to Wikipedia, bread pudding’s history originated from the 11th and 12th centuries, as frugal cooks looked for ways to use old/stale/leftover/overnight bread instead of letting it go to waste. 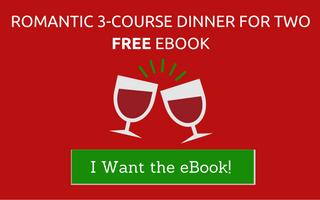 Julia Child, Jamie Oliver, Gordon Ramsay, Ina Garten, Paula Deen and Martha Stewart all have their own version of bread pudding. The Joy of Baking and The Joy of Cooking also mentioned this dessert. 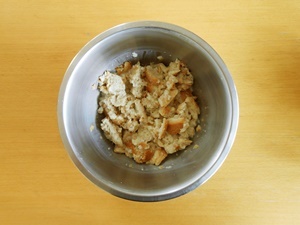 There are different flavors/types/variations of bread pudding. For example, you can prepare it with rum sauce, bourbon sauce, caramel sauce, vanilla sauce, lemon sauce, condensed/evaporated milk or apples. My mom’s yummy bread pudding recipe uses only 5 ingredients (French bread, 1 egg, etc) and is the best I’ve tried so far. It’s a big hit in the family as the bread pudding does not end up being too dry. 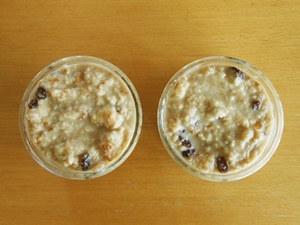 Read on to see her “you-just-gotta-eat” bread pudding recipe and tips. 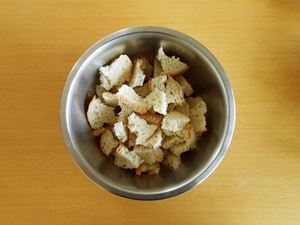 Cut the bread into pieces and put it in a mixing bowl. 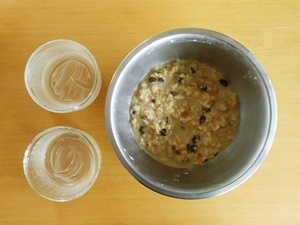 Pour the milk into the mixing bowl and mix with your hands. Add the raisins. Wait 10 min until the bread is thoroughly soaked. Turn on the oven and set the oven temperature to 180°C / 400°F. 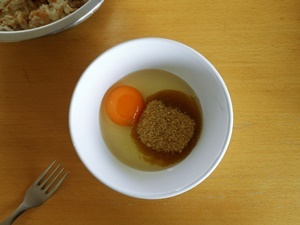 Break the egg into a bowl and add sugar. Mix well. 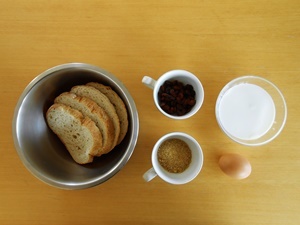 Add the egg and sugar mixture to the soaked bread from Step 1. Spread butter on the 2 ramekins. 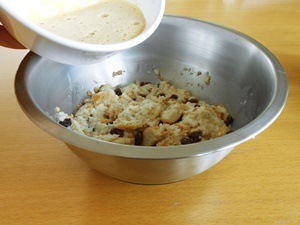 Then pour the bread pudding mix from Step 2 into the ramekins. Bake for 45 minutes. Do you have any bread pudding-related questions? Would you like to see a bread pudding YouTube video? Please comment below! 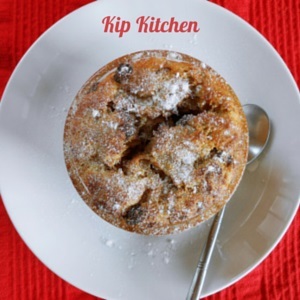 And if you like our easy bread pudding recipe, please pin it on Pinterest and sign up for our mailing list!